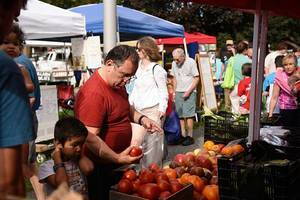 The Lebanon Farmers' Market is up and running for the season. It’s located at Colburn Park (51 North Park St.) on Thursdays from 4 to 7pm through September 28. This early in the season, fresh local produce comprises primarily spring lettuces, peas, and radishes. However, you can always find local maple syrup, honey, and jams for sale. Plus you can check out local crafters and enjoy tunes from area musicians. Bring your own tote bag. Most vendors have plastic bags for your use, but it’s much easier to have one large canvas bag to hold your purchases, especially if it can go over your shoulder. Many people bring compact personal grocery carts that fold up nicely in the car, while others bring mini coolers on wheels. Put an insulated bag in your tote or have a cooler ready in the car to hold perishable purchases such as meat and eggs. Walk around the whole market first before making purchases. That way you can see what is available and compare prices. There’s nothing worse than buying tomatoes and then finding ones that look better and are less costly at another stand. After a couple of visits, you will pick your favorite stands to visit each week. Talk to the vendors. Ask them where and how their produce is grown. Also, ask for recipes. Most are happy to share their expertise. If you use an EBT card at the Lebanon market, you will also get up to $10 in additional Granite State Market Match to spend as well. To find other sources of local food, check out the Local Harvest website (www.localharvest.org). 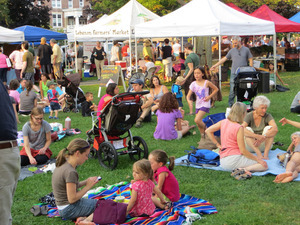 There are listings not only for markets all over the Upper Valley but also for many other locally grown food outlets such as farm stands, community supported agriculture opportunities, pick-your-own farms, restaurants, and more.